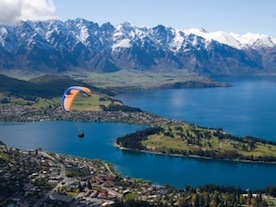 Queenstown, as everyone who travels to New Zealand knows, is where you go to throw yourself off the edge of a mountain or a bridge or out of an airplane. It's the “Eco-Exhilaration” capital of the world and if you're looking for an adrenalin rush, a 100%-pure South Island high country experience, Queenstown is full-on. You can do anything here. The latest technology pushes the envelope. Forget fear of flying: you don’t just bungee jump anymore, you Ledge Bungy, which, as the name implies, requires you to step off a ledge and freefall ─ twisting, flipping or diving ─ for 8.5 adrenaline pumped seconds. 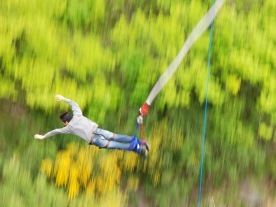 Or, you can choose to swing, at mind-blowing speeds, on a 300m arc through the Nevis Canyon. There is parachuting, paragliding, hang-gliding, skydiving, not to mention ziplining at 70km per hour through a forest tunnel with amazing views of the length and breadth of Lake Wakatipu. If you’ve been there, done that, try kayaking, canoeing, or jet-boating (invented in New Zealand). 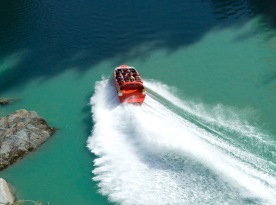 The sleek Shotover Jet is the only company permitted to operate in the Shotover River Canyons. The boats dispense with propellers, giving greater access to otherwise non-navigable rivers, into what would normally be impenetrable bush. Some naysayers would have it as being too wilderness intrusive; not “Eco” enough. The scenery is perfect, a demanding landscape of overpowering beauty. It has a rugged feel with snow-rested mountains and plunging river canyons. Upstaged of late by The Lord of the Rings trilogy, The Remarkable Mountains, rising sheer and steep, is transformed into the compelling seat of evil Sauron, inspiring a pop-culture following. Tours will guide you through the fascinating locations of Middle-earth. One can better experience the scale of the mountains from the lakes below. 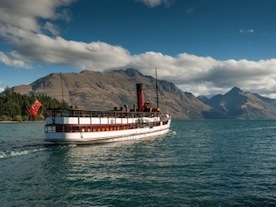 If you have a spare 90 minutes, the very cool, iconic steamship TSS Earnslaw is one of the best ways to see the splendors of the lake. Queenstown also has some of the best tracks for tramping (local vernacular for hiking or trekking) and is fast becoming a go-to biking destination. For those cyclist still seeking alpine thrills, you can experience pedaling down 500 vertical meter terrain from Gondola Hill (without ever having to pedal uphill) or the tamer, yet still challenging, 100km Queenstown trail. And, when you finally come down to earth… stop, and have a glass of Pinot. The Gibbston Valley, the area between Queenstown and Cromwell, now houses vineyards instead of the once-grazing sheep. The best local producers are Peregrine Wines, Amisfield Wine Company and Olssens winery. Peregrine has won awards for both its dramatic architecture and fine artisanal wines. The winery is designed to look like a falcon’s wing in flight, and is nobly committed to the conservation of New Zealand’s endangered native bird. There’s a lot to be said for “Eco- Exhilaration” – it isn’t just about the adrenalin rush.